We will be happy to schedule your personal tour of our community. While you may simply drop in for information at anytime, we highly recommend scheduling a specific date and time to ensure that Cathy will be available to give you the most complete information, including pricing. Cathy is our residency expert and will work with you to determine if Ranson Ridge is the best match for your senior living options. Click here info@ransonridgeal.com to schedule a tour or call Cathy Hansen, Certified Senior Advisor (CSA), for additional information at 704-897-2723. 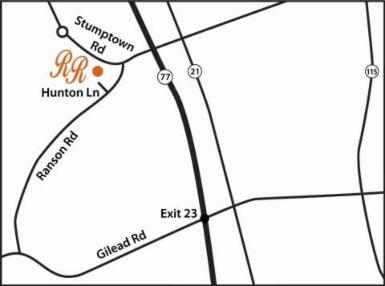 We are conveniently located near St. Mark Catholic Church off Stumptown and Ranson Roads in Huntersville. Renown Olde Knox Commons Rehab & Nursing Center is next door and Novant Huntersville Medical Center is 5 minutes away.